The potential attacks on AMD's Ryzen, with names like Ryzenfall, Masterkey, and Fallout, seem to be valid, but not an immediate worry for users. Researchers say they’ve discovered serious potential vulnerabilities within AMD’s Ryzen and Epyc chip architectures, which have now been confirmed by two independent firms. AMD said it’s taking the reports seriously, though it wasn’t provided sufficient time to investigate or confirm them before their disclosure. 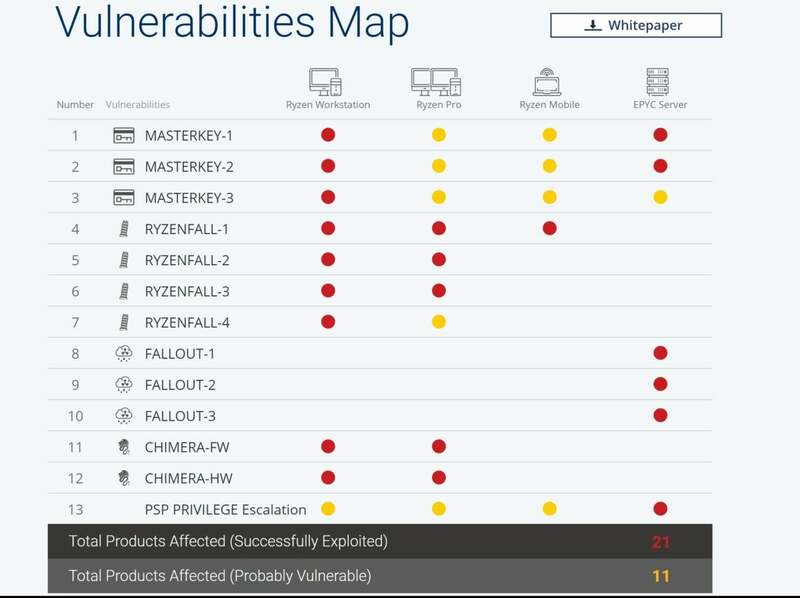 CTS-Labs, a security research company which says it specializes in vulnerabilities within ASICs and other chips, has said it’s discovered four potential attacks, code-named Masterkey, Ryzenfall, Fallout, and Chimera. All would require a program running with local access and administrator privileges to exploit them. CTS published a clarification paper on March 16 with more technical details, including a claim that an attacker does not need physical access to the machine and that the vulnerabilities were more relevant to enterprise customers, not PC users. AMD confirmed it’s been made aware of the potential vulnerabilities. However, the statement AMD provided to PCWorld implied that the company wasn’t given the usual amount of time to investigate the vulnerabilities internally, which is typically about 90 days. Instead, the company said it was told of the vulnerability the day before it was made public. In a blog post on its site, AMD added: "This company [CTS Labs] was previously unknown to AMD and we find it unusual for a security firm to publish its research to the press without providing a reasonable amount of time for the company to investigate and address its findings." As of Friday, March 16, AMD had not provided a response. Two separate firms have confirmed the vulnerabilities. Check Point Research said on Monday that it had confirmed two of the Ryzenfall vulnerabilities, known as Ryzenfall-1 and Ryzenfall-3. Dan Guido, a security researcher, also wrote that he has seen the proof of concept code and confirmed the vulnerabilities. "Regardless of the hype around the release, the bugs are real, accurately described in their technical report (which is not public [as far as I know]), and their exploit code works," he tweeted. What this means for you: At this point, nothing. It’s important to note that these attacks remain unconfirmed by AMD, though they’re potentially serious. CTS-Labs claims it's been able to exploit the vulnerabilities it found on several Ryzen chips, but no potential attack has been seen in the wild. It's also important to note that while other publications may care about the effect on AMD's share price, PCWorld does not. Are there vulnerabilities? How severe are they? What mitigations will AMD provide and when? And what do users need to do, if anything? Did disclosing the vulnerabilities so late to AMD increase the chances that they could be weaponized? As to the latter question, we don't know. But that's the direction in which we see this issue unfolding. A list of the potential AMD chip vulnerabilities, according to CTS-Labs. In its clarification document, CTS claimed that the vulnerabilities it discovered were "mostly relevant for enterprise networks, organizations and cloud providers." None of the vulnerabilities would require physical access, CTS added. An attacker would only need to be able to run an EXE with local admin privileges on the machine, the firm wrote. "The only thing the attacker would need after the initial local compromise is local admin privileges and an affected machine," CTS-Labs wrote. "To clarify misunderstandings – there is no need for physical access, no digital signatures, no additional vulnerability to reflash an unsigned BIOS. Buy a computer from the store, run the exploits as admin – and they will work [on the affected models]." BioStar B350 GT3 Ryzen motherboard. At this point, no exploits have been released to exploit any of the vulnerabilities that CTS discovered. Guido and his firm, Trail of Bits, wrote that attacking the exploits would be difficult. "There is no immediate risk of exploitation of these vulnerabilities for most users," he wrote. "Even if the full details were published today, attackers would need to invest significant development efforts to build attack tools that utilize these vulnerabilities." Likewise, Check Point was also somewhat doubtful of the threat represented by AMD's vulnerabilities. "To conclude, in our opinion the original CTS Labs report might have been problematically phrased in a way that misrepresented the threat model and impact that the RYZENFALL-1 and RYZENFALL-3 vulnerabilities present," it wrote. "However, problematic phrasing aside, after inspecting the technical details of the above, we can indeed verify that these are valid vulnerabilities and the risks they pose should be taken under consideration," Check Point added. CTS-Labs' motivations have also drawn scrutiny, including a notice on their Web site that it may have a financial interest in the subjects of its reports. PCWorld attempted to interview CTS executives, but ultimately declined the interview after CTS-Labs representatives demanded a list of questions in advance, and also forbade us from asking about the timing and the company's financial motivations. This story was updated on March 19 at 4:53 PM to add more details from Check Point Research and Trail of Bits.